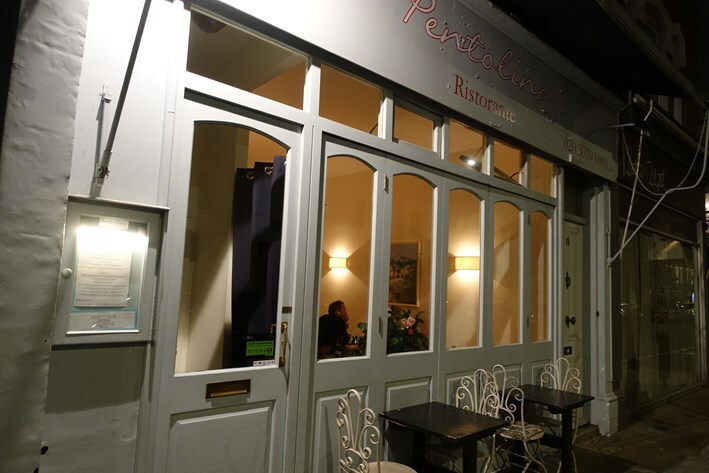 Pentlina opened in August 2011 and is a family-run restaurant, with the husband heading the kitchen and the wife looking after the front of house. The name generically means a small saucepan, but in this case refers to a house that the chef grew up in. The dining room is spread over two floors, with quite tightly packed tables. There is no music playing, but all the hard surfaces mean that the noise levels are quite high when the restaurant is busy, as it was on this Friday night. 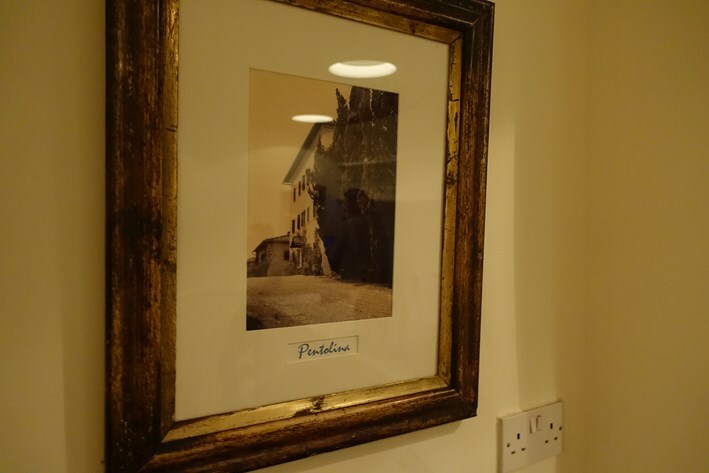 The menu was fairly generic Italian, and was quite appealing. The wine list had 67 labels and started at £20, with a median price of £36. Sample references were Bardolino Chiaretto Le XI Terre 2016 at £24 for a bottle that you can find in the high street for £8, Villa Bonomi Conero Riserva Marchetti 2013 at £40 compared to its retail price of £24, and the lovely Jermann Vintage Tunina 2016 at £70 for a wine that will set you back £42 in the high street. For those with the means, there was Picconero Tenuta Montebello Tolaini 2011 at £90 compared to its retail price of £72, and Vigna d’Alceo Castella dei Rampolla 2010 at a bargain £140 for a wine whose current market value is £179. The average markup to retail price was 2.4 times, which is pretty fair by London standards. Corkage was £15. 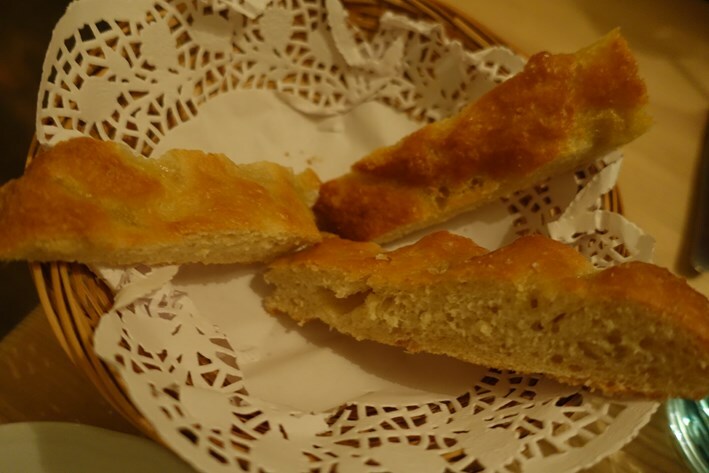 Focaccia is made from scratch in the kitchen twice daily, and here tasted fresh, with some onion adding an extra flavour (easly 13/20). 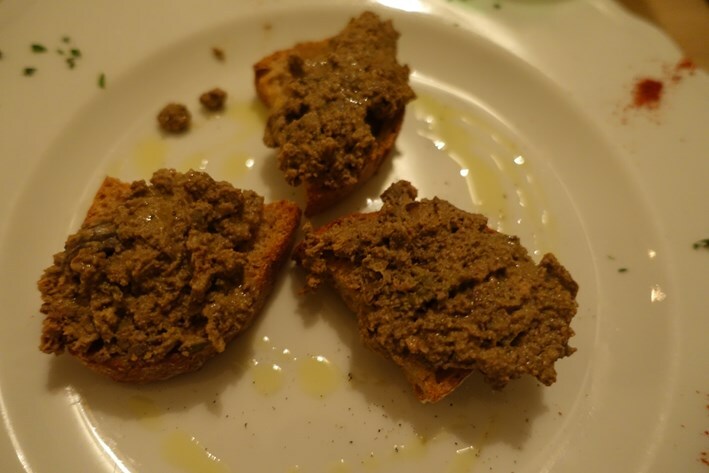 My chicken liver pate spread on toast looked distinctly unappealing and had a grainy texture though it had some liver flavour (10/20). 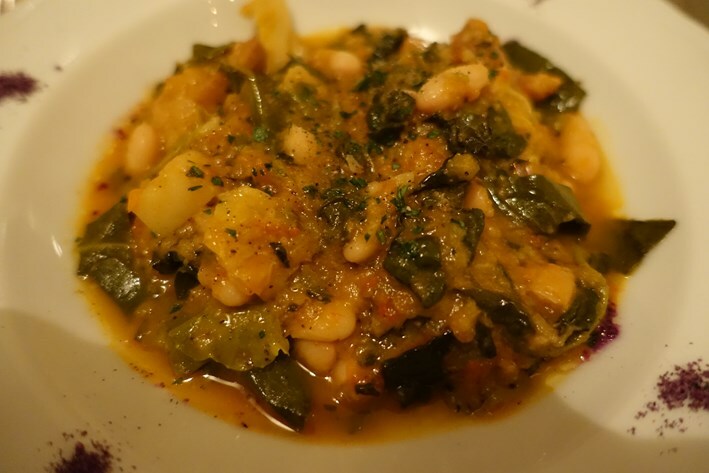 Tuscan bean soup had cannellini beans, cavallo nero, Swiss chard, bread and potato was more of a stew than a soup, for me had too much bread and potatom and sorely lacked seasoning (11/20). Pasta was an improvement on the starters. 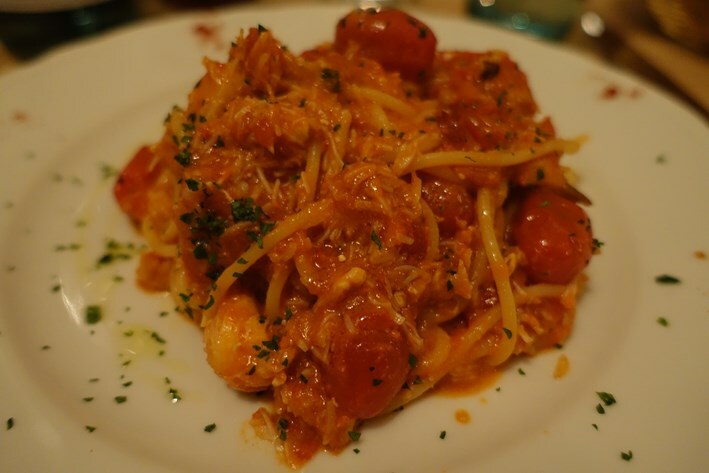 Spaghetti with crab and cherry tomatoes had pasta with quite good texture, though the crab had the odd bit of shell, and the depth of flavour was quite limited (12/20). My pappardelle with duck ragout had pasta with nice texture, though the ragout lacked intensity and again could have had bolder seasoning. 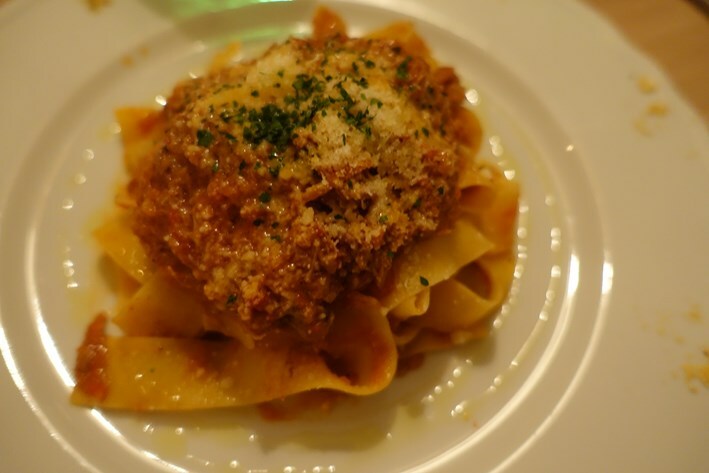 The contrast with the deeply flavoured ragout of various flavours served at nearby l’Amorosa was striking (13/20). For dessert, tiramisu was made in the kitchen but was strange. There were a few coffee beans as garnish but coffee flavour, surely the whole point of a tiramisu, was almost entirely absent from the sponge fingers. All that I could really taste was cream and a bit of cocoa powder. 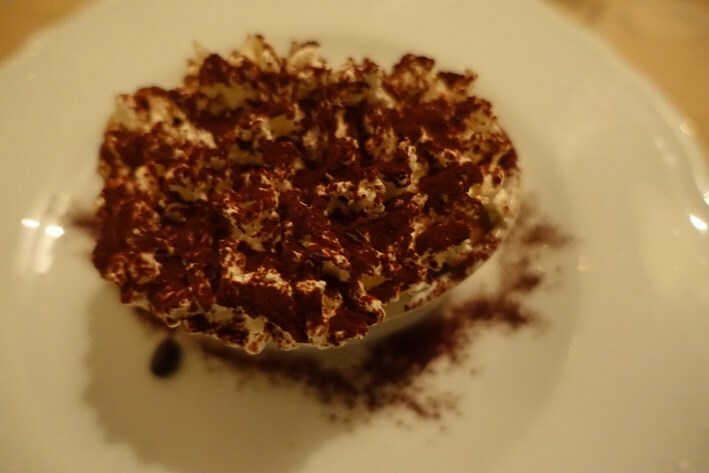 This was quite a sad tiramisu (9/20). Coffee, on the other hand, was from Drury and was fine. Service was friendly and pleasant, and the bill came to £36 a head including corkage but before service. If you shared a modest bottle of wine then a typical cost per head for three courses and coffee would be around £55 or so. Overall this was rather disappointing apart from the focaccia and my pasta, and any meal where the bread is the best single dish is pretty evidently under-performing. The restaurant has clearly carved out some sort of niche with the locals, and was busy on this Friday night, but despite the nice service it is not somewhere that I am very likely to head back to.